It’s a tough time to be an investor. And what happened? The markets came roaring back to life yesterday with no market-driving news. That’s because right now most news is just noise. Good news, bad news, “not as bad as expected” news, just fills the business pages. Most of today’s headlines are nothing but a distraction to investors. We’re in the early stages of a long recession, unemployment is still on the rise, and most investors are still weighing the eventual impact of it all on earnings and expected future valuations. In short, we’re entering long period of volatility. So that’s why I recommend forgetting the day-to-day news and sticking to what’s important. And that’s time-tested strategies that work. Today, we’ll look at how one strategy any investor can follow to safely make us between 30% over the next few months – whichever way the markets go. It’s been a wild couple of months for the markets. We’ve been through the strongest rally in 70 years. Still though, all the signs we’re entering a depression are still evident. But this is the stock market, driven by thousands of individual decisions, opinions, and analysis, so it’s impossible to predict the next move. That doesn’t mean there’s nothing we can do though. There is. It’s just not as simple as buying a stock, have it go up, and then sell it anymore. In a market like this, where the struggle between hope and reality will linger on and keep volatility levels high, we’ve got to go a bit deeper in our tool boxes to find strategies that work in this environment. Because the one strategy needed to take advantage of this opportunity, relationship analysis, may be a new concept for some and require some more advanced investing techniques (in this case, shorting stocks). Relationship analysis is founded on the principle that certain assets tend to be closely correlated over the long run. In a normal market, closely-related assets move in similar fashion. During periods of high volatility, the relationships sometimes get pushed way out-of-whack. Over time though, they almost always work their way back to historical norms. And that’s where the opportunity lies. When a relationship gets extremely skewed, it can be very safe and profitable to ride it back to normal. Let me explain. Some of the most predictable relationships can be found in commodity stocks. Think of the relationship between the price of gold and gold mining stocks. As the price of gold goes up, so does the expected earnings of gold miners. The higher earnings justify a higher stock price. It’s the same across all commodities like oil, silver, fertilizer, copper, etc. Other common relationships exist between commodities themselves. For instance, gold and silver prices have been closely related for centuries. The gold/silver ratio shows how close they are. Since they are both precious metals, one can be substituted for another. So when the price of one gets too high, the other catches up as it becomes the cheap alternative. Let’s take a look at the last skewed relationship we uncovered. The markets tend to focus on and the short term. It’s always more interested in what’s going to today and a few weeks from now rather than what’s likely to happen over the next few months. That’s what creates the opportunity in relationship trades. Just take a look at our “Trade of the Year.” This is an opportunity we caught on to last December. At the time, the relationship between gold prices and gold stocks had completely fallen apart as tracked by the Gold/XAU ratio. It didn’t make any sense. And it wasn’t going to last. The relationship between gold prices and gold stocks was so far out of whack, something had to give. Either gold prices had to go down, gold stocks had to go up, or some combination of the two. That’s why we recommending shorting gold and buying gold stocks. Since then, the gold has held steady and gold stocks have risen significantly. Our recommended trade netted a low-risk 35% gain. Now, another closely related pair of assets has grown significantly out of whack and I expect similar gains over the next few months. The energy market has been very volatile over the past few months. Oil prices have nearly doubled from their lows a few months ago from expected demand from China, expectations the worst of the credit crunch is over, and hopes OPEC’s reduced production mandates will be followed. Natural gas prices, however, haven’t fared nearly as well. Natural gas in North America is actually down about 50% from its credit crunch price levels. Over the last year and a half, the Oil/Natural Gas ratio has averaged about 11. Which means a barrel of oil was worth the same as 11 Mcf of natural gas. But when the markets started going haywire, so did the relationship between oil and natural gas. Last summer when oil spiked to $147 a barrel, natural gas didn’t go along for the ride. The ratio soared to 16. 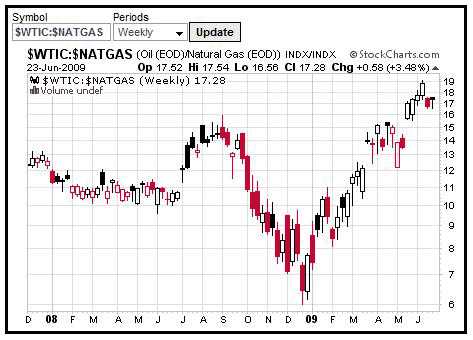 When oil prices collapsed, natural gas prices fell. But they didn’t fall as fast as oil prices. As a result, the ratio fell to a rock bottom level of 6. Now, with oil prices coming off a sizable run, natural gas prices near multi-year lows and showing no signs of a significant recovery anytime soon, the Oil/Natural Gas ratio has reached another extreme. As I write, the ratio sits at 16.8 (West Texas Intermediate:$69.16/NYMEX Natural Gas Future:$4.10), well above its long-run average of 11. The simplest way to play it would be to short U.S. Oil Fund ETF (NYSE:USO) and buy U.S. Natural Gas Fund (NYSE:UNG) in relatively appropriate amounts. These funds track oil and natural gas prices, respectively. And although there are some differences due to their structure, contango, and other factors, you’ll be in position to ride them back to normal. You’ll profit as the ratio makes its way back to 11. So whether oil falls, natural gas rises, or some combination thereof, you’ll be positioned to benefit. As the ratio works its way back to normal, you’ll be sitting on gains of about 35% after all is said and done. Although this strategy may be a bit more advanced, it’s something worth getting comfortable with. After all, it’s going to be a tough time to be an investor over the next few months. The spectacular rally has ended. The days of watching stocks climb 5% to 10% each week are over. And the volatile swings will only add stress to an already stressful situation. But either way the market goes from here, I’m confident this is no time to get down on the markets or investing. Right now is the opportunity to get prepared for the next few years. It’s a time to learn new strategies. It’s time to develop a plan to make it through the tumultuous years ahead. Because if you get prepared now, we’ll be in comfortable position regardless of where the economy goes, which new regulations and taxes will change the way people live, and by having a few more strategies in your investing tool box, you’ll be allowed to take what the market gives you whichever way it heads from here. And that’ll be well worth the effort.